Hang Man heads our three runners at Sandown on Wednesday as he bids for back-to-back wins on the Hillside course. Hang Man (pictured) runs in race four, the Benchmark 78 Clanbrooke Racing Handicap over 2400m and will be joined by Mirimar and Touch A Cloud. Hang Man was a comfortable length and a half winner in the same class last start on June 13 and Ballymore Racing Manager Anthony Feroce said the import has trained on well. "He's done well since the win. 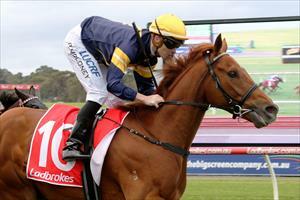 He’s a horse that can relax nicely and he's got a very good turn of foot for a stayer," Feroce said. "Our plan is hopefully in the autumn he can get to a race like the Mornington Cup, which is a Caulfield Cup ballot-free race. "The field looks like it's got a bit more depth than last start, and he's going up a little bit in weight, but it does look another winnable race for him." Touch A Cloud runs in race six, the Benchmark 64 Handicap for 3YO Fillies over 1300m. The daughter of Glass Harmonium ran well for a long way at her last start when sixth at Sandown and Feroce said dropping back in distance will suit. “She just got tired late at her last start over 1600m so we feel dropping back to the 1300m will suit her,” Feroce said. Mirimar runs in race three, the Benchmark 64 Mypunter Handicap over 1800m where he will be ridden by Jamie Mott. The import ran well on his Australian debut last month and Feroce said the four-year-old son of Kalanisi has come on since. “He has improved since his first-up run and will strip fitter for the race on Wednesday,” Feroce said.